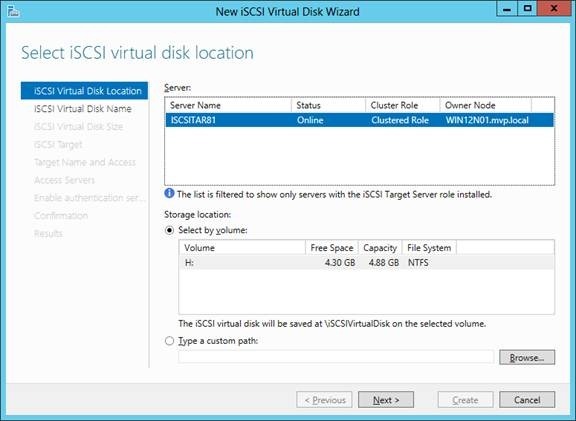 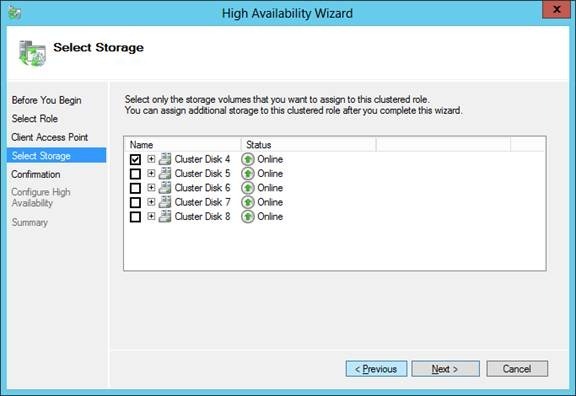 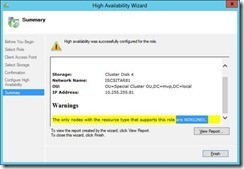 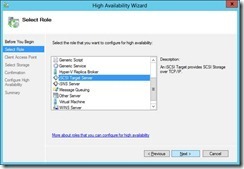 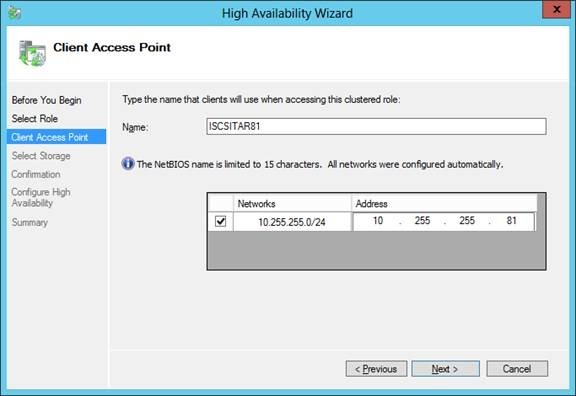 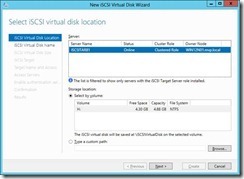 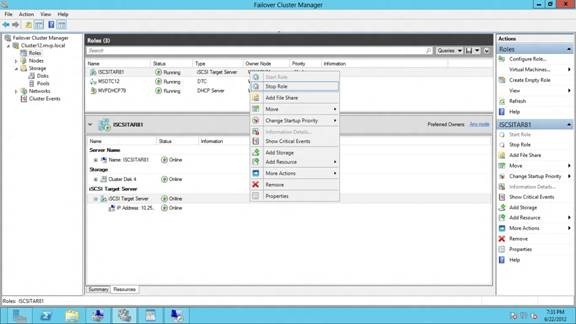 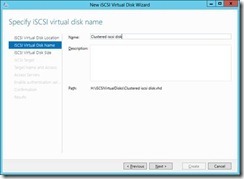 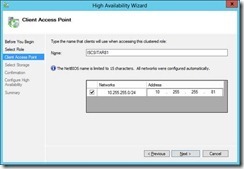 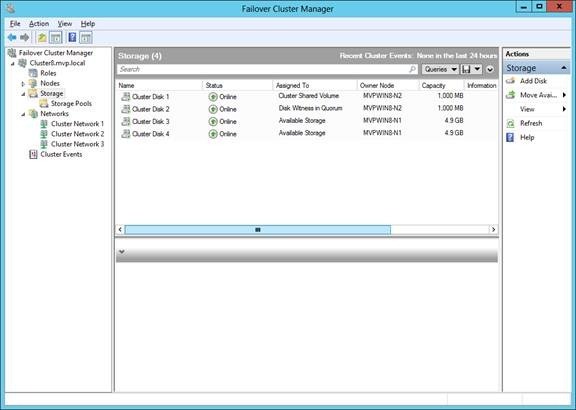 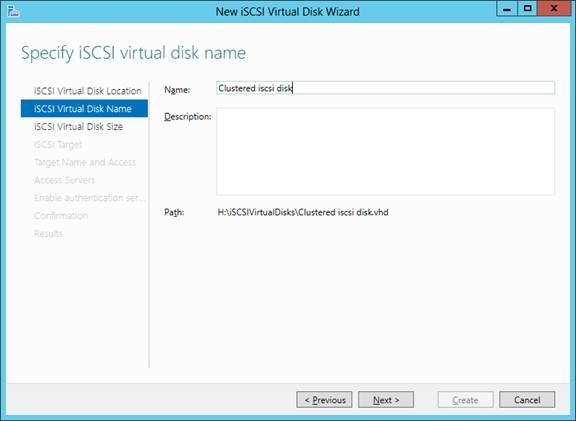 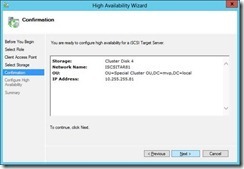 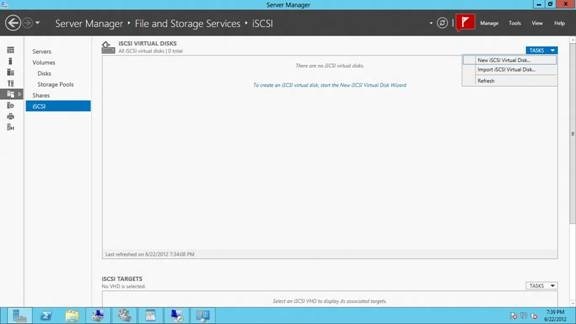 For Creating a ISCSI target on a cluster you get a high available iscsi target. 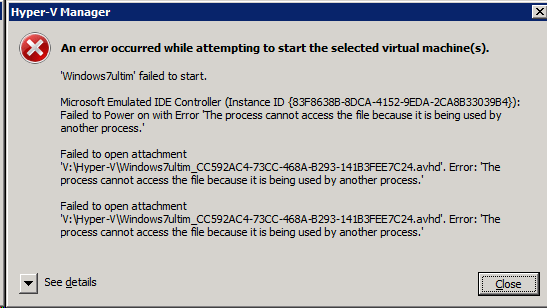 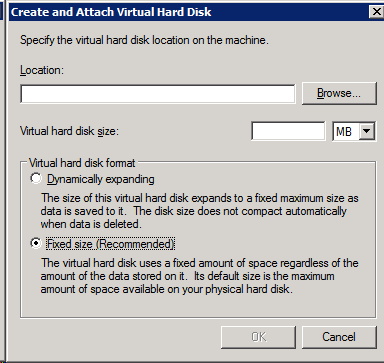 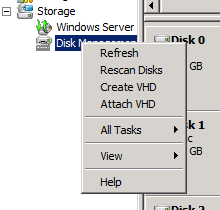 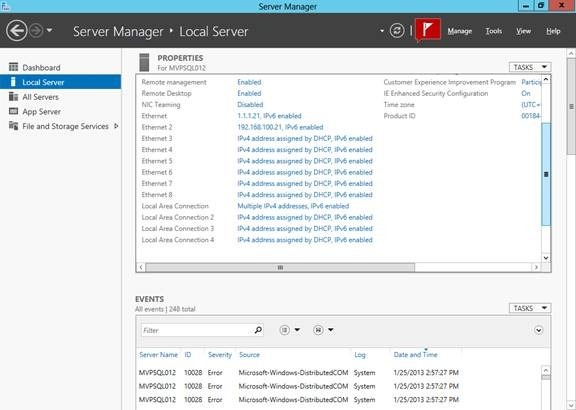 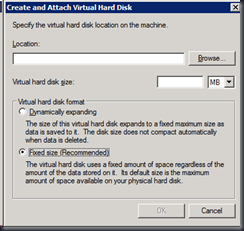 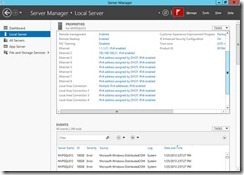 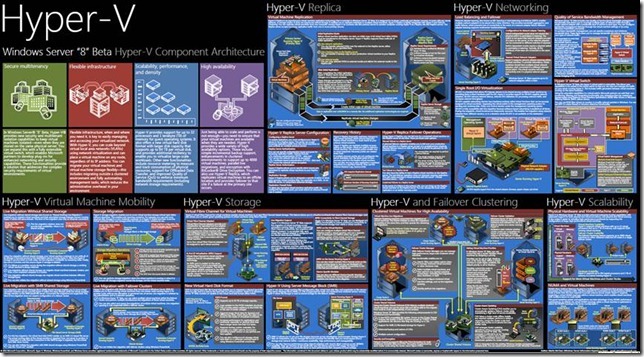 Sure you can run this on a single server (VM ) and move this between the hyper-v nodes. 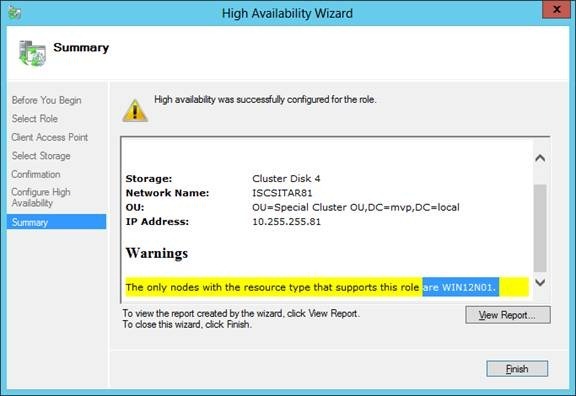 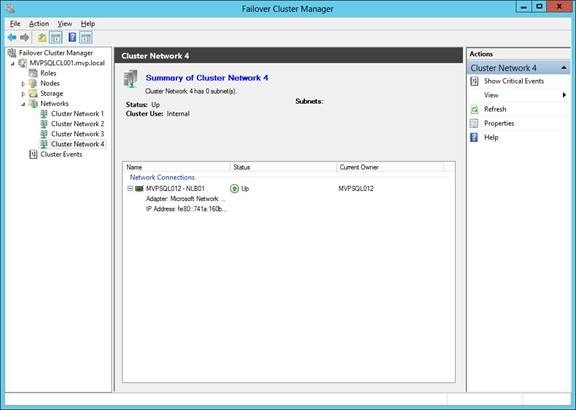 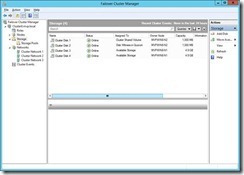 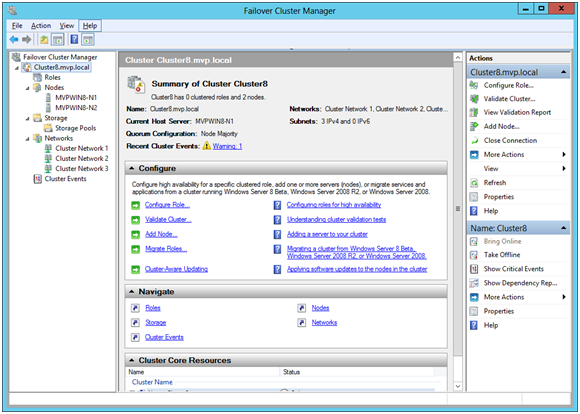 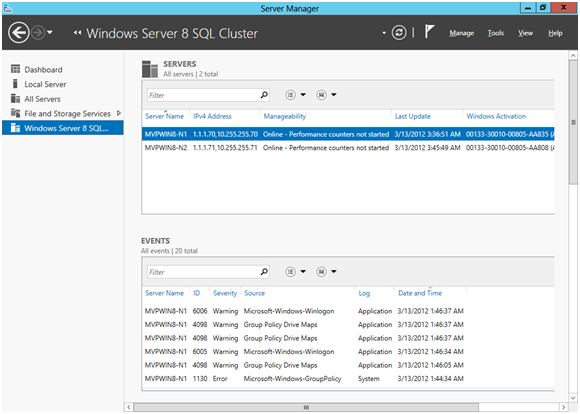 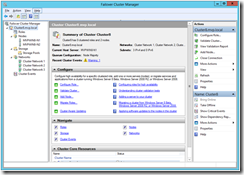 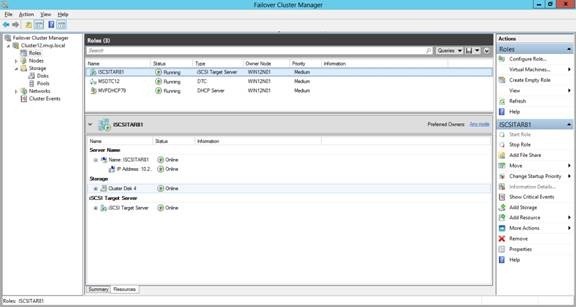 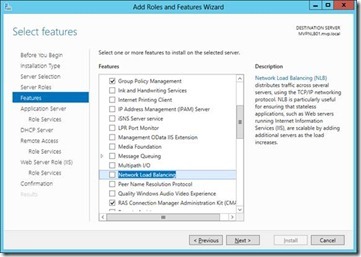 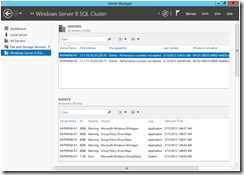 for doing this in a cluster you need to do the following steps. 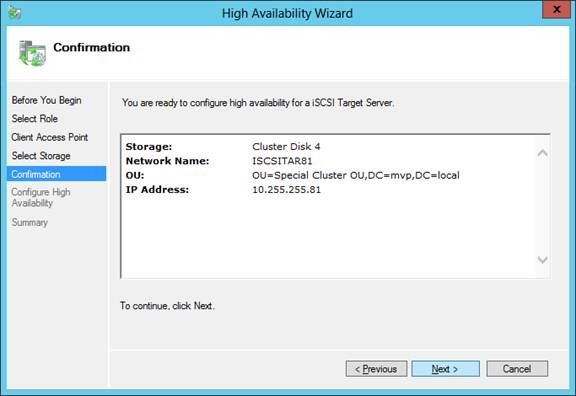 Now that the cluster resource is created the iscsi target is ready to use. 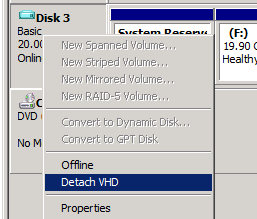 As here you can create a new VHD file and use this for targeting , I have no groups so this needs to be created first. 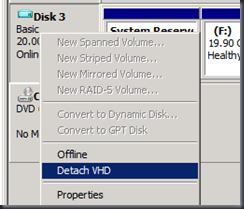 I use a small disk just for testing. 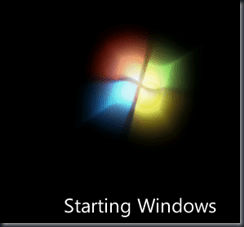 Now that Windows 2012 is here and you want to test if the OS is as good as you want and see if the application is still running on windows 2012. 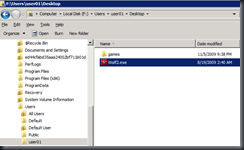 In this case We build a NLB website easy with just the basic steps any one can do this. 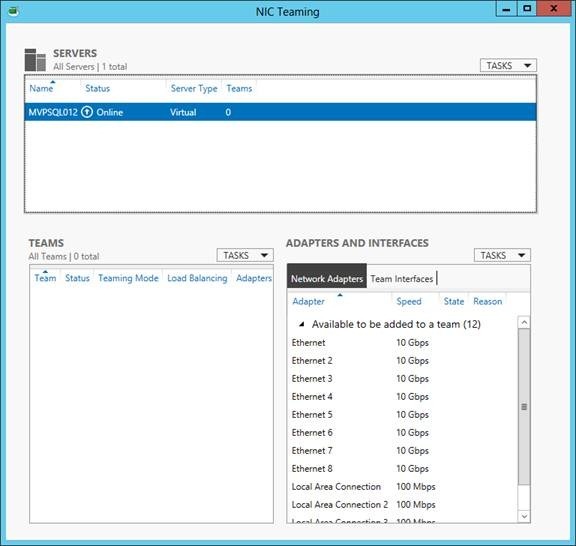 First we add the roles and features to the servers that we are going to use for the NLB. After this I look at my NIC’s most important that you use two nic’s in a VM this is easy in a physical box now days there are at least 2 nic’s in the server. 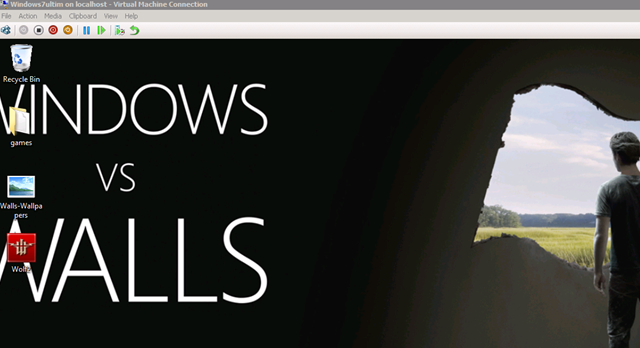 use them. 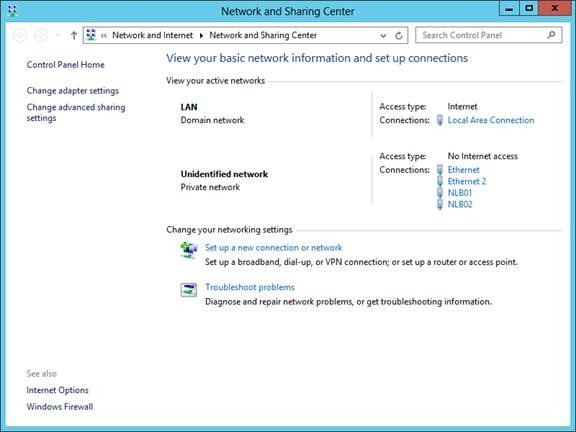 Sometimes you need more network true put than you have. 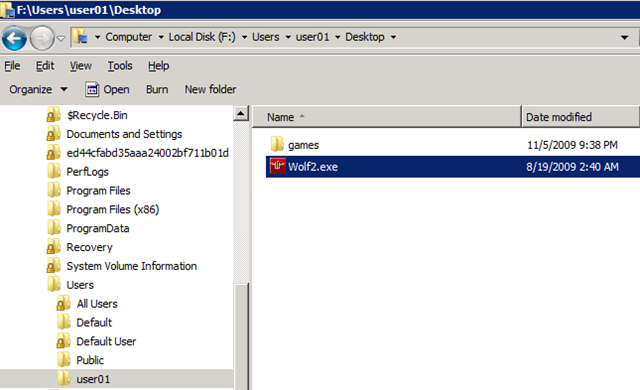 But did you know you can create a Team in windows 2012 ? 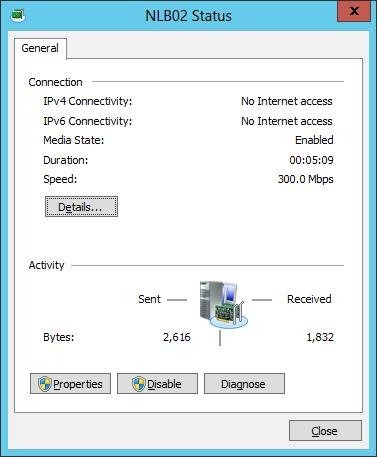 This is the Maximum count of network adapters in a VM. 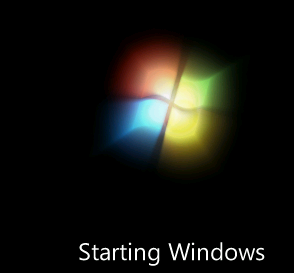 This in not only in windows 2012 but also in Windows 2008R2 no changes there. 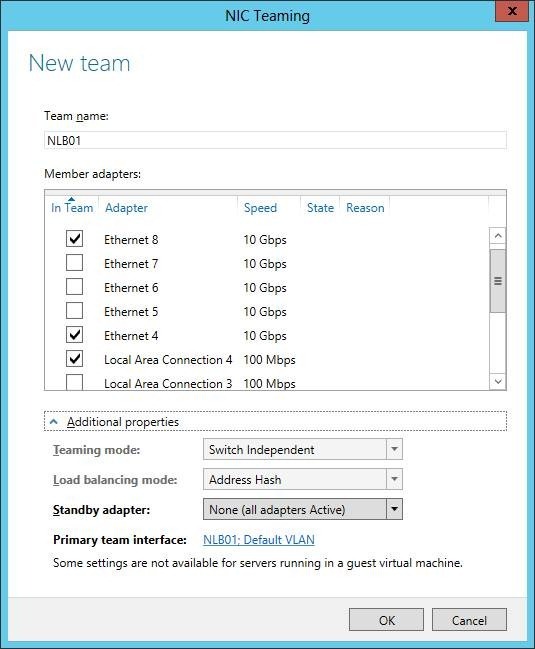 In this sample I will create a team with a 60GB network true put and one 300 Mb network adapter just because you can 😉 I could create more but I need different nic’s on my cluster. 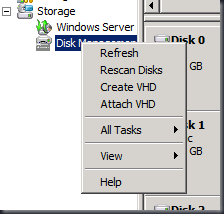 As you can see NIC teaming is no disabled , but click on disabled a new window pops up. Did you see I added 10gb and 100 mb nic’s oh whoow 10,1 gb nic this makes no sense remember this only if this is a backup line and the nic is not active but standby. 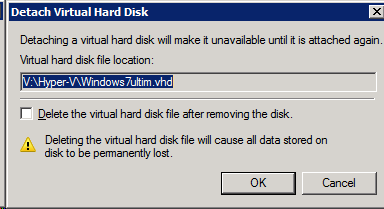 In general this is a bad Idea. 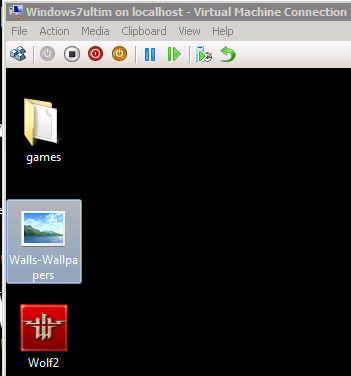 but for now I do this just because you can. 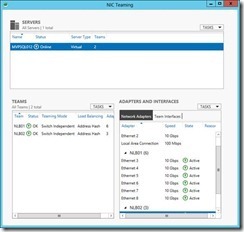 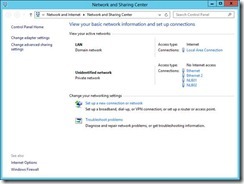 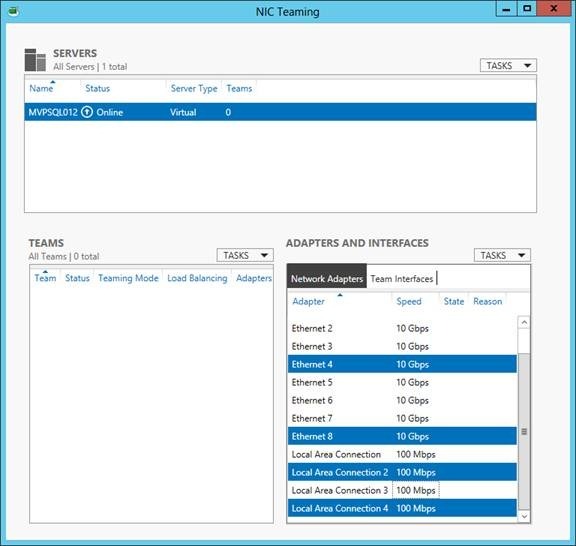 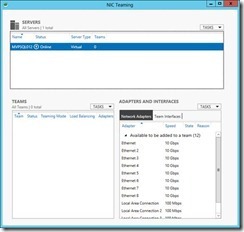 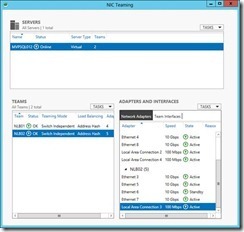 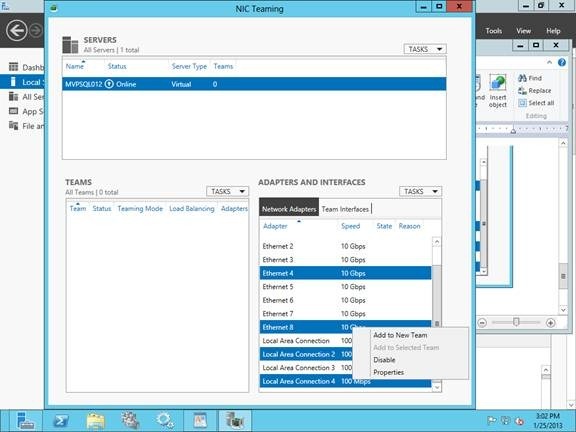 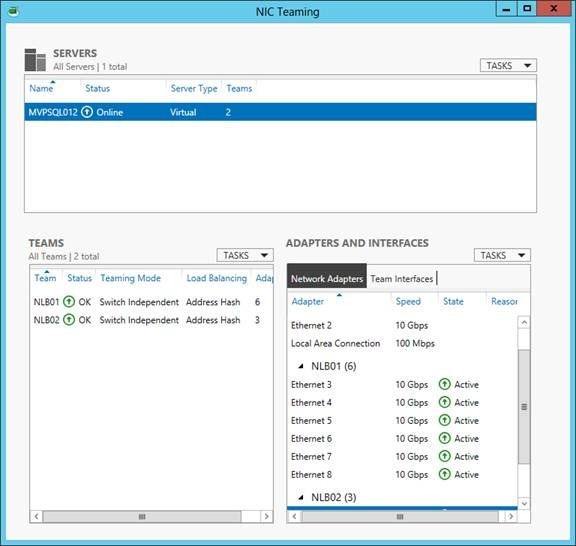 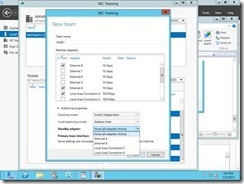 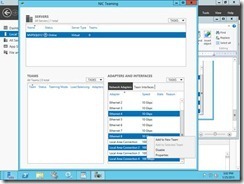 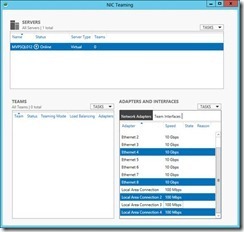 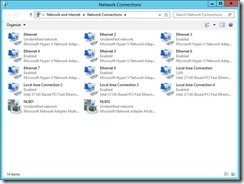 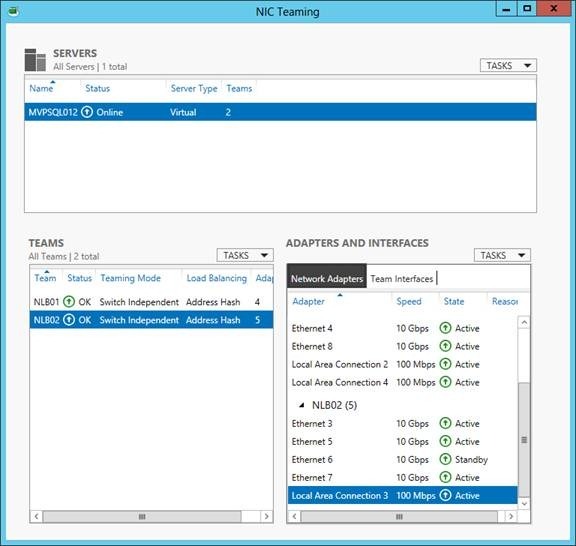 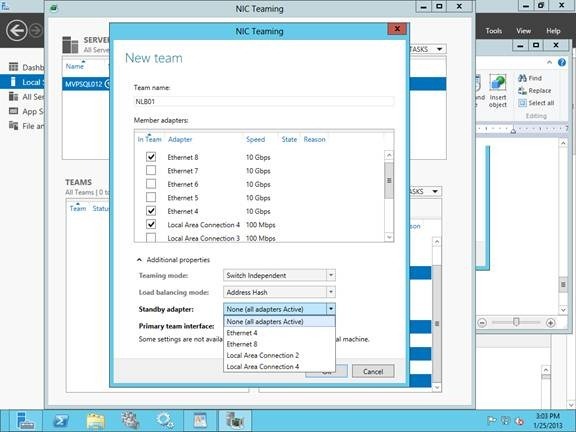 When configuring NIC Teaming in "Switch Independent" mode, the teaming configuration will work with any Ethernet switches – even non-intelligent switches – because Windows Server 2012 handles all of the intelligence with this NIC teaming mode. 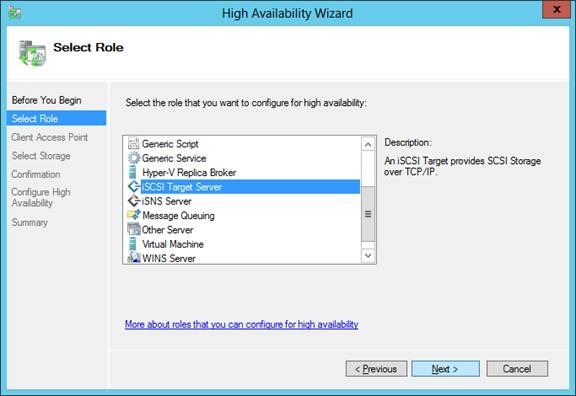 No special configuration changes are necessary. 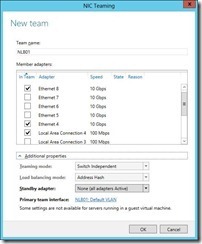 You can even use this mode to team across separate switches in scenarios that require switch diversity for extra network fault tolerance. 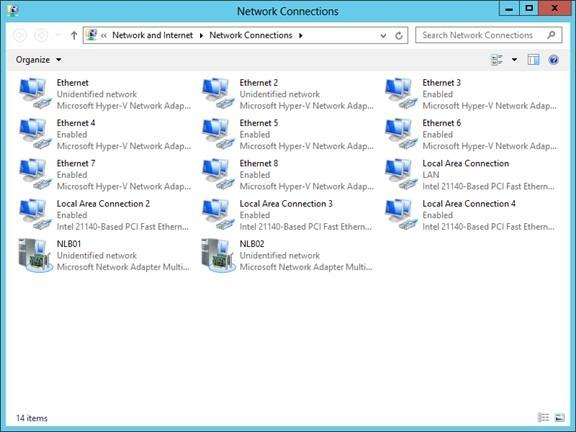 As you can see the networks shows up in my cluster so you can use them directly or you can create several virtual networks on top of this NIC team. 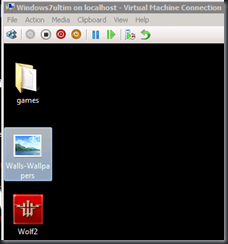 this will be in my next blog.